There are 3 types of variables we need to know, but in a good experiment only 2 things should ever change really change. The word "variable" comes from the verb to vary, which means to change or become different. Variables are all the things that can change or be made different in an experiment. The first is called Independent Variable, and it's the thing that the scientist intentionally changes or makes different - it's the thing they're trying to test. You can think of it as the experiment's input, and it can cause other parts of the experiment to change in response. The thing that changes as a result is called the Dependent Variable, and it's what the scientist needs to observe or measure. You can think of it like the experiment's output, or the effect of the Independent Variable. Other parts of the experiment could change, but a good scientist wants to keep as many things as possible the same to ensure a fair test. (Too many things changing means it would be hard to tell what affected what.) The parts of the experiment that the scientist keeps constant, or unchanged, are called Controlled Variables. We use a Control Group with regular, normal, unchanged conditions, to compare against the Experimental Group, the thing being changed and tested. 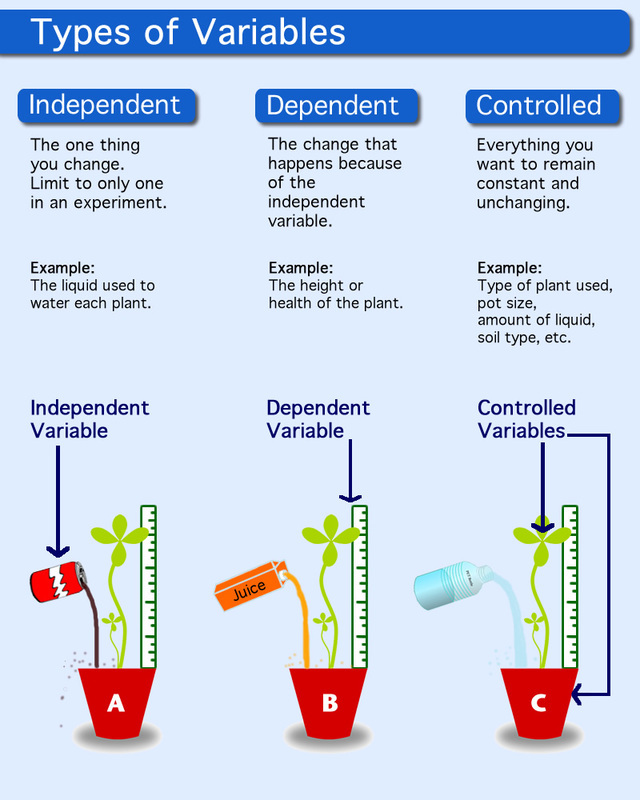 The video below further illustrates the differences between Independent, Dependent, and Controlled Variables. Another way to tell apart Independent from Dependent Variables is to remember the acronym "D.R.Y. M.I.X."